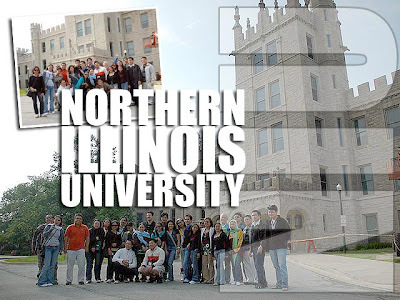 Northern Illinois University (NIU) in DeKalb, Illinois is going to be our home away from home for the next four weeks. A public university founded in 1895, it has 25,000 students in seven degree-granting colleges that together offer 54 undergraduate and 74 graduate programs, and 12 doctoral programs. DeKalb is about an hour and 30 minutes (104 kilometers) west of Chicago. Sad to say, there is no train service to DeKalb so we couldn't sneak out to Chicago that easily. Oh well! Anyway, We got to tour campus today and visited some of its older buildings, including Altgeld Hall which houses the administration, and the East Lagoon where some wild Canadian geese can be found. NIU was in the news early this year being the site of another campus shooting incident in February. But all is well here and life has moved on. 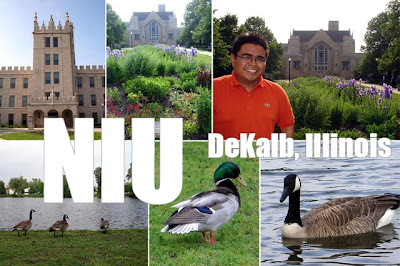 As the motto of NIU goes: "Forward, Together Forward." miss you guys...as busy as i am, i miss the group talaga! great pics! but where are pics of me/me with you/me with the group?! lol - JOKE. hope all is well. i'm going crazy doing my work dito sa San Diego. talk to you soon!